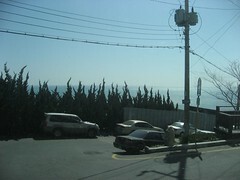 After my wife became pregnant, she joined the Busan Momsholic. Momsholic Baby is a national club in Korea which was set up for both pregnant women and mothers. They provide an online community as well as a number of off-line opportunities to meet and participate in activities. 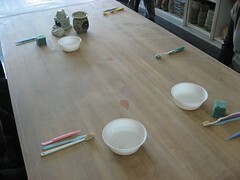 Recently some of the expectant members, along with their partners, signed up on a first-come-first-served basis to a one-off pottery class and my wife and I went along at a cost of 10,000 won per couple. 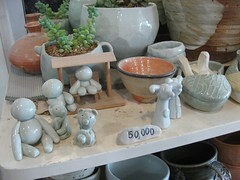 The class was being held at the Nature Ceramic Studio in the Haeundae district of Busan, which is high up on a hill with some rather attractive views of the sea, near a large restaurant curiously entitled Tom's Dinner (sic). 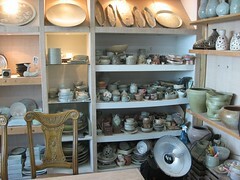 The Studio regularly hosts classes in various rooms, but perhaps because it was a Sunday we were able to work in the main gallery which forms the store front. A photographer was in attendance and while he snapped away he told us that the previous group had been very serious and we should try and have fun. That proved to be easier said than done; with most of us operating beyond our comfort zone even with the guidance provided by the teacher, it seemed to be an activity requiring all our concentration. So I think he'll be telling the same story to the next group. 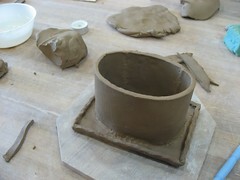 The plan for today's class was to create oil burners. 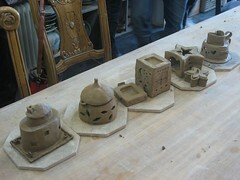 My wife and I decided to fashion a house of sorts, with the roof serving as the oil reservoir. Gradually, this evolved - more by accident than design - into two houses, one with a vaguely Mediterranean feel I suppose. The other, by virtue of it being much smaller and more haphazard in construction and finished design, looked suspiciously like the kind of Korean house you can still sometimes find deep in the countryside. This wasn't lost on the other people present - 'ah, that looks just like a Korean house' they said 'you've developed a fusion design!' Fusion is anything here that mixes Korean with anything non-Korean - from fusion food to our 'fusion' baby. I wasn't really comfortable with the outcome - the 'Korean-style' house looked so ramshackle and inferior to the one below it that it ran the risk of not being so much a fusion as an editorial comment. Anyway, we won't give up our day jobs. In the end, I don't think any of the couples had much of a chance to socialise, so if that was the intention it probably wasn't successful. But since it is perceived that the process of artistic creation is 'good for the baby', it presumably served its purpose. Hi Lee - it's one of the new ones launched under Blogger Draft. Go to the Layout tab and then you should see a new "Template Designer" sub-menu. This is one of the "Awesome Inc." designs. The new templates are a bit easier to customise and play around with, but I found them a bit of a mixed bag. There were some issues with the underlying XML on this design and I had to change a couple of things at code level. Drop me an email if you want to discuss any specifics. Thanks Mike! I'm going to change when I have enough time to experiment. Also glad that you came back to Korea and resumed blogging. You know, someday in the distant future your upcoming child may end up reading all the interesting thoughts you've managed to write down here. If I never get the chance to truly converse with my descendants as intellectual equals then what I write here might be the only insight they get into who I really was and what I experienced. I fear it may not reflect well on me but it is better than nothing at all! I have a theory that the post-singularity humans who I expect to be born in the next generation or two might hold a morbid fascination for their immediate forebears. Perhaps the Internet archive will provide them some insight into who we were and the lives we led. This is of course, assuming the the Internet histories survive! Sticking with Google's Blogger seems about the best bet one can make in that respect. Yes, my wife said the same thing to me this morning - regarding the survival of internet history. This is the first internet bred generation and I think what will be clear later may not be worked out yet. Available memory space continues to skyrocket, just a decade ago we were carrying around 528k diskettes. I predict that we'll soon be able to download the entire content of any one website onto a flash drive, or store it in an online permanent archive at a price of, say, $50 for 100 years. 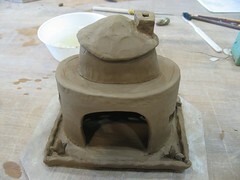 I stumbled across this blog entry because I google searched "ceramics studios Busan". Do you know the address for this place? 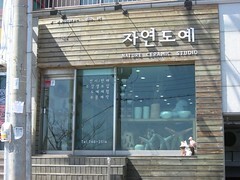 I just recently moved to Busan and I'm interested in taking classes somewhere. Thanks. Yes, I noticed their website doesn't seem to be working now, and I can't find their details on Naver so I'm not sure if they are still around. Their phone number is 746-2514 - I'm afraid I don't have the address. It isn't particularly easy to get to because it's up a hill some distance away from the nearest subway station, but it seemed to be a good place.